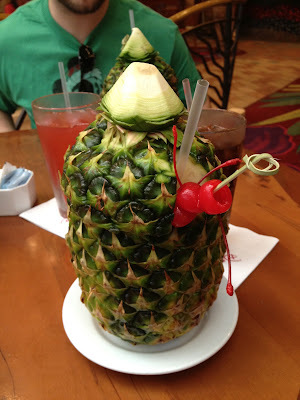 Joanna and her Amazing Technicolor Interwebs: WDW Trip Report - Day 4 Dining - They Bring it in a Pineapple?? 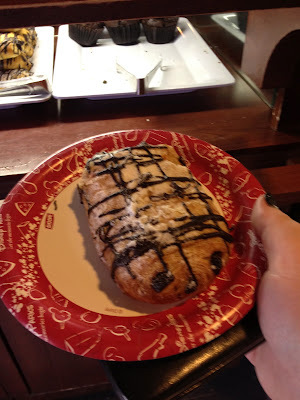 WDW Trip Report - Day 4 Dining - They Bring it in a Pineapple?? By our fourth morning, we had a nice little rhythm going: wake up at 8 AM refreshed from a good night's sleep after a great but tiring day the day before, get ready, and pick a park to go to. 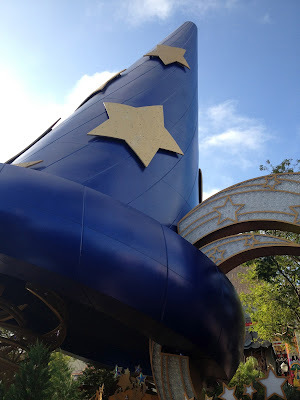 This morning we chose to go back to Disney's Hollywood Studios to hit a few attractions we had missed. Our "late" arrival meant the the queue for Toy Story Midway Mania was too long to wait in and the FastPasses available were for after we'd be gone from the park for the day. 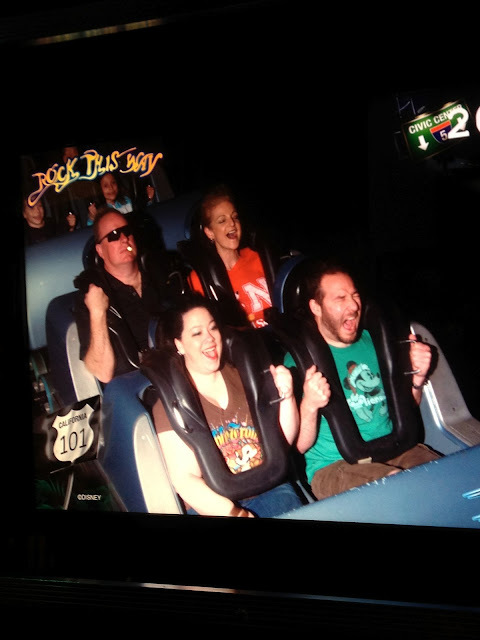 We rode it twice in June, so I wasn't too heartbroken to miss it. Really when it comes down to standing in a queue for 2+ hours or enjoying 3 other attractions in the same amount of time, I'll pick other attractions. Besides, it's not like I'll never be back in the parks with opportunity to ride those attractions I missed. Instead we went back to the Great Movie Ride where I saw the Alien for the first time ever. That's right, up until this moment, I had hidden my head in fear of the Alien and had not seen it! Thankfully it wasn't as scary as I had anticipated. I suspect if the attraction were newer it would be much more frightening. I want a door like this some day! Before we left the Studios we rode Star Tours one more time and luckily got to see the Naboo ending again. Seemed like that was the perfect way to end our time at Hollywood Studio. 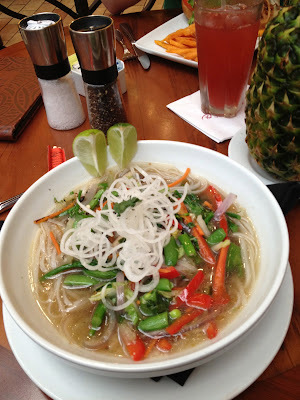 Our lunch reservation was for a late lunch at Kona Cafe at the Polynesian Resort. At Christmastime, all of the resorts are decorated for Christmas. The Deluxe Resorts' decorations are so incredible that they're worth a special trip to see. We needed to ride the Monorail to the Polynesian, so we stopped at the Grand Floridian on the way. 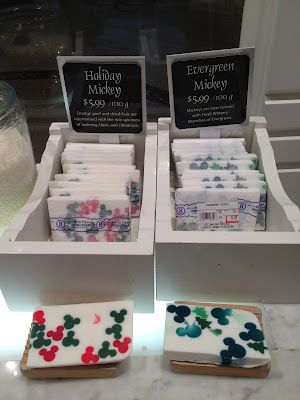 Right where you walk inside from the Monorail, there is a bath supplies shop that sells handmade soaps and other such wonderful smelling things. I got a couple of soaps with Mickey heads in them, and Kyle picked some soaps up for Christmas presents. Then we went downstairs to see the Gingerbread House. Can I move to Disney to be a baker now? 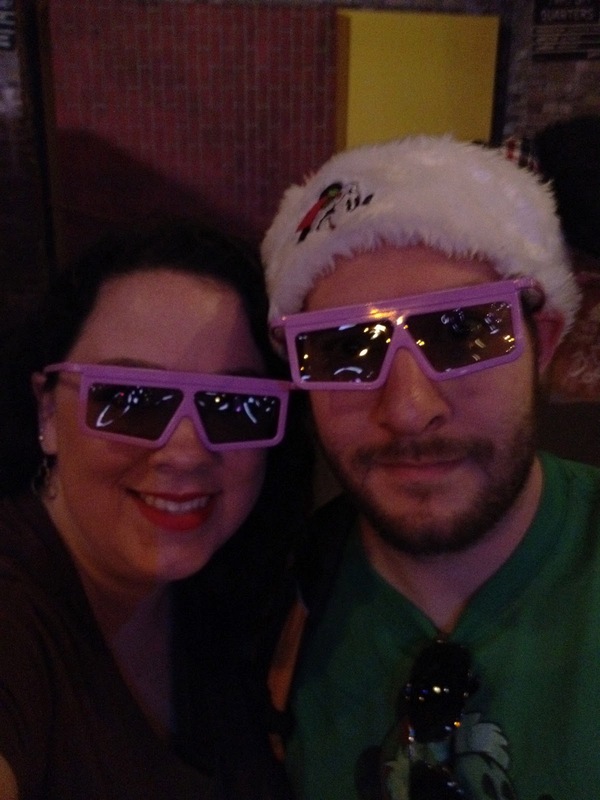 to get the Muppet Vision 3D Vinyl. From there we hopped on the Monorail to go to the Poly. This was my first time seeing the Poly, and I was not disappointed! The decorations were spectacular, and the general feel of the resort was calm and peaceful. I love how each Deluxe Resort at Disney feels like its own little world outside of Florida. When we arrived at Kona Cafe, we were taken to see all of the desserts. Of course I snapped a photo of each! To our great joy, we were given a table kind of off to the side, so it gave us another rare moment to chat over our meal without feeling like our neighbors could join in at any time. This was my favorite meal of the trip (with Teppan Edo being a close second). We started by ordering drinks. Both of us got the Lapu Lapu which has both a delightful taste and presentation! It comes inside a whole pineapple!! My drink was really sweet, but I definitely felt the effects after lunch. (If you can't tell by now, I'm a bit of a lightweight when it comes to drinking. It doesn't take much for me to feel the effects... which is kinda nice for my pocketbook.) 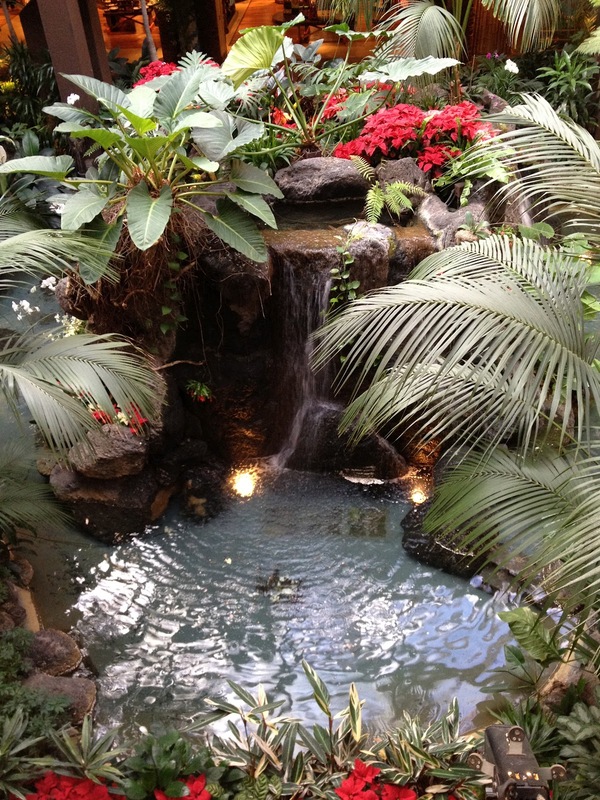 If you want to relax with a fun drink, take the trip over to the Polynesian. It's well worth the time. I was apprehensive about the food here prior to the trip as I wasn't sure I'd find something I'd really enjoy. I had a hard time deciding between a safe cheeseburger and the tasty sounding Asian Noodle Bowl. In the end, I decided to take a risk and try something new, and I wasn't disappointed! My mouth is watering now just thinking about this meal! The beef in the bowl was tender, and the beef broth it all floated in was rich. It was served with a side of some sort of hot sauce. Be careful with it as it is very very hot! I used just a little bit, and I could really feel the heat, and I'm not a lightweight when it comes to spicy. 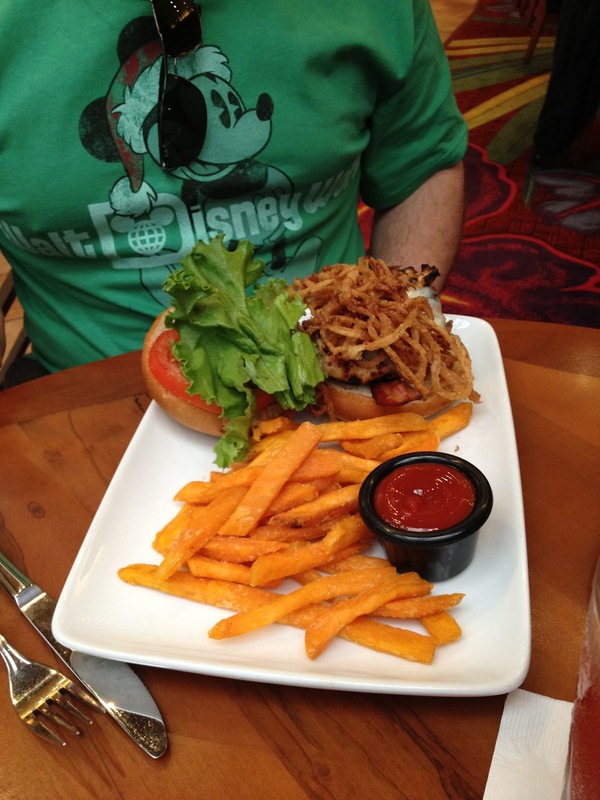 Kyle got the Island Chicken Sandwich (I think), and while it looked good, I was quite happy with my choice. For dessert I let out my inner child and ordered the Kona Kone which is basically a waffle cone with chocolate and vanilla ice cream surrounded by a cloud of blue cotton candy and topped with Mickey Sprinkles. It was a fun treat to enjoy, and like the drinks, the presentation just added to the enjoyment. Kyle stuck with the Polynesian theme and got the Pineapple Upside Down Cake. 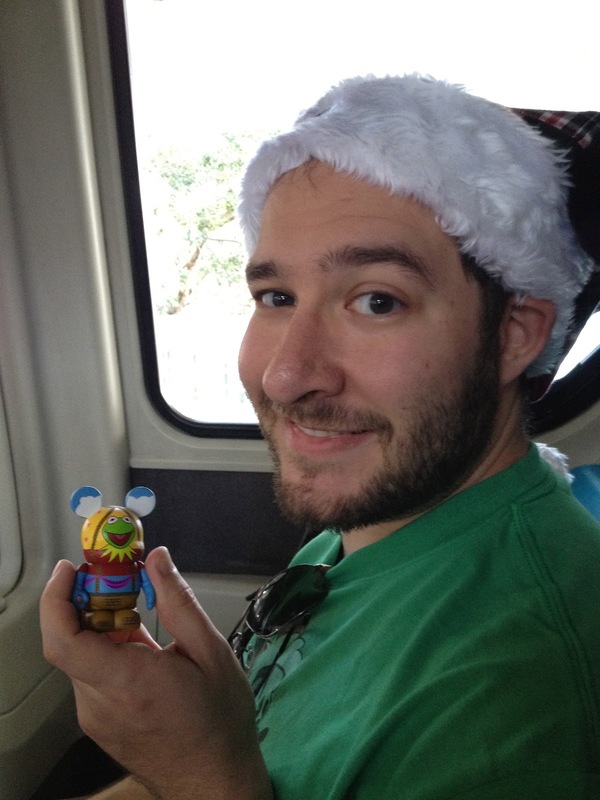 After our amazing lunch, we went back to our resort to relax and change for Mickey's Very Merry Christmas Party. It was nice to lay around for about an hour to recharge before our potentially long night at Magic Kingdom. It emphasized that this trip was full of much needed leisure for us both. Kyle had just come from some very stressful, LONG days at work, and I was at the end of the semester, getting my students ready for Final Exams. It was definitely a much needed vacation for us both! Next post will be completely about Mickey's Very Merry Christmas Party!